Premier of Nevis and Minister of Finance in the Nevis Island Administration (NIA) Hon. 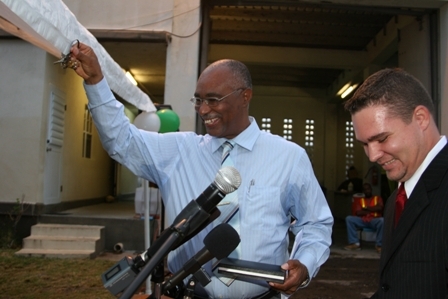 Joseph Parry, received the keys and cut the ribbon to commission a top of the line US$575,000, 2008 E 1 Titan 6×6 Aircraft Rescue and Fire Fighting appliance on August 14, 2008 at the Airport at Newcastle. The event which took place against the backdrop of distant lightening and thunder signaled the increased operating standard of the traveling facility to the new level 8, up from level 5.
stationed there. A problem he said that had been inherited from the former administration. “I am very happy this afternoon to stand here before you with this truck in the background. It is a brand new truck which has been brought here by the Nevis Island Administration…We decided to spend the money, we decided we wanted to have a truck to bring the services up to grade five so that the airport can be opened at all times…We have ensured today that the [American] Eagle would land at anytime, once the Eagle wishes to come to Nevis and to this airport,” he said. 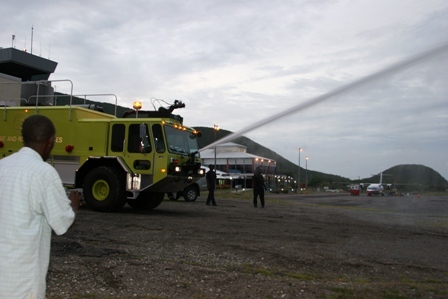 Meantime, while Mr. Parry urged Nevisians to join the St. Kitts and Nevis Fire and rescue Services, he commended all who ensured that the services at the airport were restored quickly but pointed to personnel at the Fire Services Department who he said had been operating in trying circumstances. this island of Nevis and since we are speaking of these men and many of them are Kittitians, I want to the people of Nevis both men and women to join the Fire Services. “At least you do not have to worry about guns, you are doing a service where the public is behind you, the public is supportive of you and they need more people they need more hands. Contact the officer in charge of Nevis and talk to the Officer in Charge in St. Kitts because we really need to make sure that we can keep our airport safe,” he said. The Premier indicated that future plans included a good fire truck in Charlestown and an extension of the Fire Services to the areas of Newcastle and Gingerland because there was the need for quick response and to give full service to the island. for true development to take place on Nevis, adequate services had to be provided since the people of Nevis expected the best when anything happened. “This government is all about training…We have dedicated ourselves to education and training because we know that is the key to upward mobility and the key to development. I can assure you that we have established our priorities and our priorities are in technical training, vocational training, engineering etc. That is the problem that we face at this moment. So I am now appealing to the parents to work on the children to pay attention to mathematics and on the sciences so that we can have more persons to train in these areas. In the mean time we continue to train our people, it will be for the benefit of our country,” he said. Moments before the keys of the new fire tender were handed over by Manager of Customer Services, Argo American Inc. Mr. Stefan Williams, he gave Premier of token of appreciation. He said it was an honour to work on the project. 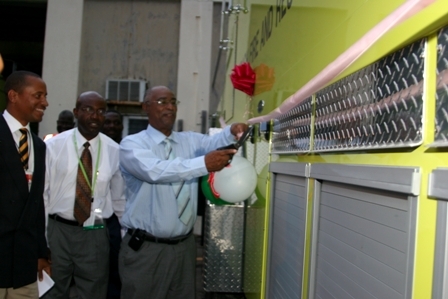 He referred to the new fire tender as a symbol of Nevis’ future growth and congratulated Nevis for its investment. 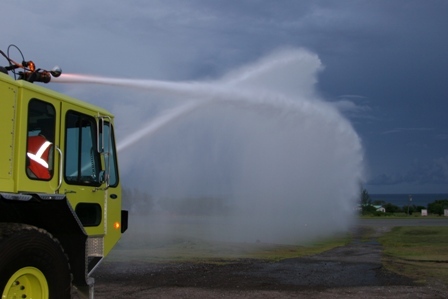 “This is a great opportunity for everybody here in Nevis, not only will it help support your airport and continue your growth it also expands the way for future fire trucks for your new Fire Department as you grow and we look forward to working with you on those projects as well, ” he said. 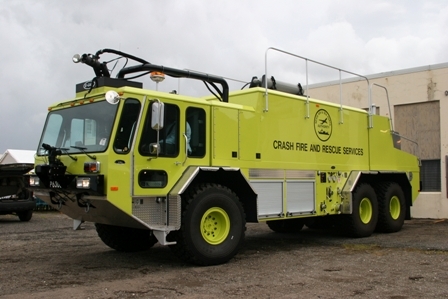 Mr. Williams further stated that his Company would continue to work with the Fire and Rescue Services on Nevis, to ensure the staff had the necessary training to operate and maintain the new fire tender. Argo American Inc. has worked solely in the Caribbean for the past 25 years and had worked closely with the Nevis Electricity Company Ltd. for the past 10 years having provided equipment, training and maintenance. 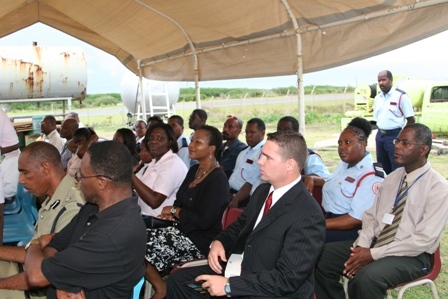 Among those present at the ceremony were members of the Nevis Island Cabinet, Head of the St. Kitts and Nevis Fire and Rescue Services and members of his staff on Nevis Mr. Hester Rawlins, Management of the Nevis Air and Sea Ports Authority and Head of the Nevis Police Division Superintendent Samuel Seabrookes.